Here at Maker Ed we’ve been excitedly preparing for World Maker Faire, which takes place on Oct. 1-2 at the New York Hall of Science. We’re organizing some amazing presentations and hope to see many of you there. Jackie Gerstein will be participating in Maker Ed’s “Meet the Maker Educators: Inspirational Stories from the Cutting Edge” talk on Sunday. If you’ll be at the Maker Faire, stop by the Education Stage to say hello, and whether you can make it or not, follow us on Twitter for live updates during the Education Forum and Education Stage talks. Jackie Gerstein is a teacher at Union County Magnet High School in Scotch Plains, NJ and the primary organizer of the UCMHS Makerspace. She is a mentor for FIRST Robotics Competition Team 1257 and co-advisor of the district’s Technology Students Association chapter. When she’s not teaching teenagers to make mistakes, break things, or build things, she’s usually doing the same on her own projects. The Union County Magnet High School makerspace has its roots in Fubar Labs. After I joined Fubar in 2010 I wanted to bring the things I loved about it – exploration, community, and the freedom to make mistakes – to my students. For the next few years, I used informal maker time, open-ended projects, and the district’s FIRST Robotics team to achieve these goals. In fall of 2014, as part of a conversation about increasing the presence of hands-on work throughout the school, I brought up makerspaces and the value they could bring to our students. The next morning, my principal greeted me with “I did some reading – let’s do this!” and our journey to having a proper makerspace began. Working with a local special needs school to help their students with custom assistive technology. Our initial planning involved student representatives, faculty, and administrators as well as advice from organizers of local makerspaces and our school’s advisory board. Before discussing equipment, we discussed the goals of our space – student ownership, creativity, and resources to support student ideas. In addition to the general goals mentioned before, we wanted students to feel a sense of ownership and we wanted the resources to better support student projects. We started building up our resources in an existing room while making plans for an eventual move to a larger space. During this period, we formed a partnership with a local special needs school to help their students with custom assistive technology. 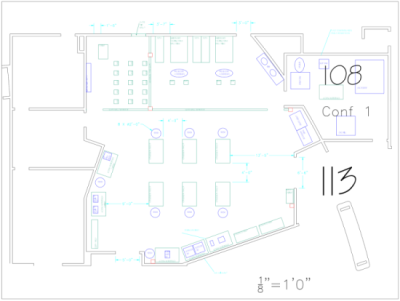 Early draft of makerspace floorplan. The next year, with the support of a new principal, we formed our Makerspace Committee, a group of students to share the workload of designing the space. A core group took full advantage of this opportunity to shape their own school; they put in many hours researching, investigating other spaces, and planning the new space. They drew up a floor plan, reviewed their ideas with faculty, and met with the architect to ensure that the final plan reflected their vision. It’s been a long journey, but there have been wonderful moments that kept us motivated. The smile of a girl receiving custom armrests was one of the highlights for all of us. The meeting between our students and the architect helped solidify the nature of our space as a project by the students, for the students. I drew energy from the many firsts, such as the start of demolition, the first posts on the website and social media, and the first discussions with teachers in other subject areas wanting to integrate the makerspace into what they do. Members of the student planning committee. As incredible as this experience has been, we could have made some improvements, primarily by being even more inclusive and including others earlier. I wish we’d entrusted the students with responsibility for their makerspace earlier in the project, as it truly changed the nature of the experience. We should have reached out to faculty outside the technology department as well; my colleagues are starting to see the vision of what we’re creating, but it’s been a mystery to them for most of this time, and we could have benefitted from their input as well. 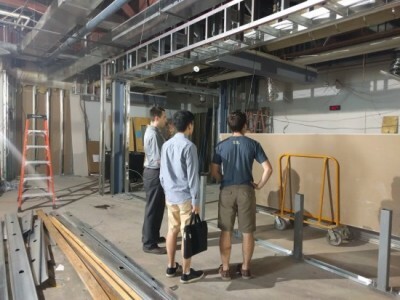 Overall, though, the student-driven nature of the space has really defined what we’re doing, and I’m glad we shared the process with our students. I love this – student centered!! As the parent of one of these students I can attest to how significant it has been to have had them involved in the planning process. It makes the building of the Maker Space all the more meaningful to them. It has expanded their horizons, allowed them to think like planners and brings them together in a way that other school related events do not. A huge thank you to Ms. Gerstein and our supportive principal for all of this. Ms. Gerstein, you have been an amazing visionary! As former Principal of UCVTS Magnet, I was the one that exclaimed “I did some reading – let’s do this!” 🙂 Jackie is an incredible educator and visionary as stated by Ms. Cohen Martin above (hi Paula:). I am currently a principal in the country of Qatar, but proudly keep track of where Magnet Maker Space is in their progress. Mr. Rafalowski has done an incredible job of slowing down and getting the students more involved as well as other stakeholders. Our work with the local special needs school brings relevance to why ingenuity and creativity make a difference to our society as well. It creates great synergy and meaning to how being a “maker” can be so rewarding! I can’t wait to come back to NJ and see the incredible MakerSpace after it is completed. Great work Jackie, Mr. Raf, and all of my former wonderful Magnet HS students! You guys are amazing!!! !